March gave us two days of excellent pow conditions last Thursday and Friday. The last storm arriving today, Saturday 29th brought rain and wet snow to most of Idaho high elevations. 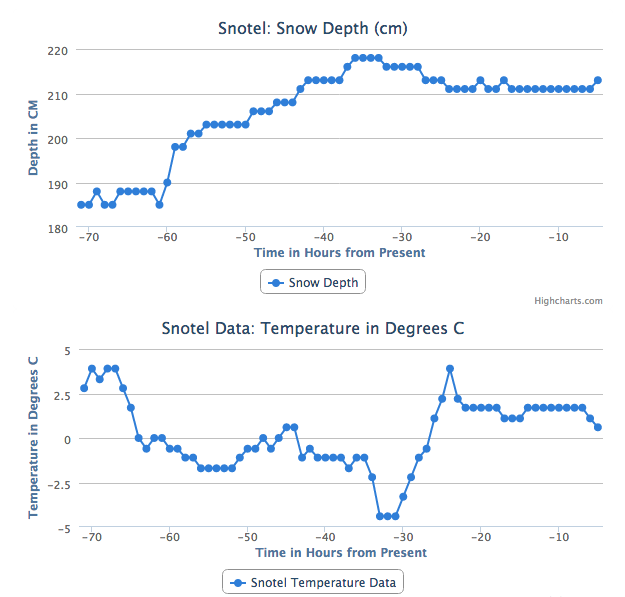 Mores Creek Summit snotel tells the story very well; temps are well above freezing and snow depth holding constant after 15 cm of liquid water precipitation. Hopefully temps will drop tonite and new snow above the rain and wet heavy snow from today should make skiing fun for tomorrow. The chart included below was generated using snowgeek.org trip planning tools. The next video is long. I recognize I am a terrible video editor, and it was hard to cut what looks to me like pretty good pow skiing. Pedro and I took turns with the GoPro camera. Enjoy it. March 27th Pow Skiing at Pilot Peak from Santiago Rodriguez on Vimeo. Early in March we had another pow ski day: http://www.morescreeksummit.com/2014/03/great-start-for-march-2014-pow-skiing.html but the snowpack structure did not gave us confidence to ski lines above 35 degrees in steepness. Similarly, Thursday snowpack structure provided us with evidence of instability and limited our skiing to lines below 35 degrees in steepness. The next pics illustrates cracking of a soft slab above fragile near surface facets with rimmed precipitation particles from the early part of the storm. The weak layer interface responsible for surface cracking reside at a depth of 25 cm. This reactive weak layer rests above a fragile decomposing crust. Below the crust another layer of facets was buried 30-35 cm from the surface. Both weak layers failed stability tests with easy scores (CTE and ECTP1-2) and sudden collapses (Q1). Not surprisingly, every slope we skied exceeding 30 degrees produced spider webbing fractures, but the soft slab nature inhibited propagation. Indeed, we were deliberate to avoid any slope impacted by wind transported snow as well as wind slabs at ridge tops. It snowed for most of the day, augmenting the snowpack depth by 10 cms by day end. Too bad we could not count with our usual cooler weather to preserve the good snow! Naturally, anticipating the storm arriving Friday evening we experimented with an extended column tests were we loaded the equivalent of 20 cms of 10% snow. The extended column produced fracture propagation with sudden collapse and planar character. Tomorrow Sunday I will be touring the backcountry to understand the extent of this latest instability cycle. The best skiing could be found at treed and open meadows that protected the snow from strong south easterly winds. Once more the coverage at the creek bottoms and road level is pretty good, providing with fun skiing top to bottom! Walking back to the car along I21. The later part of March Pedro and I spent it at Silverton Colorado teaching a Silverton Avalanche School Avalanche Level 2 course. In addition we spend time with Chris Landry from the Center for Snow & Avalanche Studies coordinating the near future installation of three miniFMCW radars developed by Pedro and I. Below few assorted pics from this year Silverton Avalanche School Avi l2 course. Please feel free to contact Jim Donovan at Silverton Avalanche School (SAS) if you are interested in participating in their courses, or better - if you want to be part of next year SAS AVI L2 courses with me and Pedro. Space is limited. In addition, there are a number of new didactical techniques recently developed by us that allow to cut the classroom time to half day for SAS Hut based courses. This leaves 3.5 days for field work! And, Red Mountain Pass in Colorado with its complex and variable snowpack typical of high elevations provides ideal terrain and snowpack for learning snow science and advanced travel techniques.